« Christmas Gifts – Saturdays at The Milk Market. When I was little we knew it was Christmas because Mom started making the Christmas cookies. 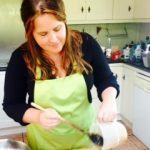 At the start of every December she would start baking a few batches every day, filling old biscuit and sweet tins with all sorts of bars and cookies. They’d be piled everywhere in the kitchen and scullery (even stashed under the couch), fifteen or twenty different tins and you’d have to go through them all to find your favorite. We all loved the sugar plums, Dads favorite were the cherry bars, we fought over the tree and reindeer sugar cookies and everyone hated the mincemeat squares -they were the only ones left in January. 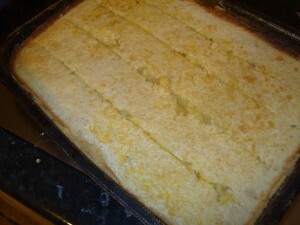 I love these Lemon Bars and picked these to share in The Irish Food Bloggers recipe exchange. We only make these at christmas ,which is odd now I think about it, as they are so good and not specifically christmas flavoured. But tradition is tradition -it would be like having christmas pudding in July . 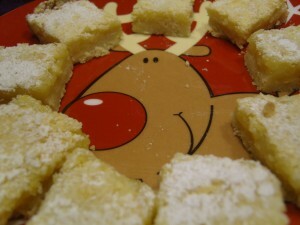 They are ridiculously easy and the fresh lemon flavour is a fabulous contrast to the fruity stodginess of most traditional christmas food. 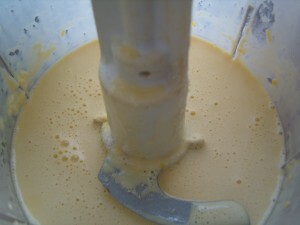 I’ve tweaked the recipe from the Better Homes and Gardens Cookbook here. 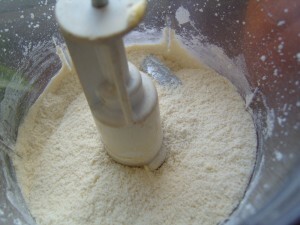 Using a food processor whizz up the butter, 1/2 cup sugar until combined then add the 2 cups flour and whizz untill crumbly and shortcakey. 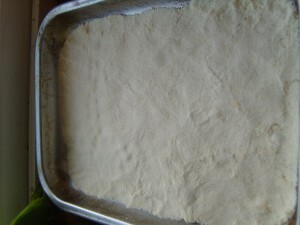 Press into the base of an ungreased 13 x 9 x 2 baking pan and bake for about 15 minsat 350 degrees until golden. 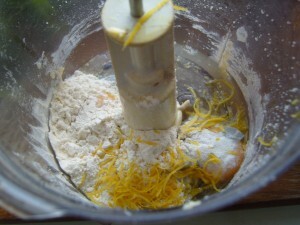 Whilst that is cooking whizz up all the other ingredients until combined making a thin custardy filling which turns into a lemoncurdy yummieness when cooked. Yum! 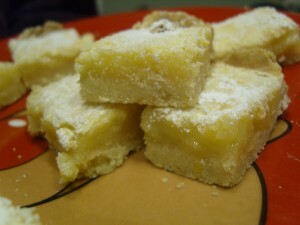 Lemon Bars are Jay’s favourites. I’ll have to give these a try!